As I’ve written a few times before, I am a self-taught quiller. I had never even seen quilling paper art in person before I started trying to learn the craft. Honestly, I can’t even remember where I first saw quilling at all, but I know it was online somewhere about 7 years ago. And since then, I’ve been searching for as much information as I could to learn new tricks and tips in an attempt to make my designs cleaner and more well-constructed. Whether you’re looking to start selling your design in an online store like Etsy (if so, click here and we’ll both start earning some free listings, whoo hoo!!) or you just want to feel like your crafts are just a little more “professional”, there are lots of ways to polish your craft. To start, I’ve thought of a simple list of 8 ways to take your quilling to the next level. One of the easiest ways to improve the quality of your quilling paper designs is to use a ruler. Let’s say you are quilling a flower with 8 petals. Unless the design calls for the petals facing different directions or perspectives, they will probably all be the same size. The best way to make all your petals the same size is the use a ruler to measure your paper strips before you start rolling the coils. Measuring your strips will only take a few seconds and will make all the difference in your work. In addition to a ruler, quiller’s who are looking for a little help in making all their coils exactly the same size might also look into using a quilling guide board. Guide boards are plastic sheets with a number of circles (and sometimes other shapes) cut out. After rolling quilling strips on your needle tool, you would place the coil right in the cut circle and let it relax there. Because the coil can’t expand any larger than the circle hole, these boards can be incredibly helpful when quilling mass quantities of the same size coils. This is key, especially if you’re looking to mass produce, or even try to recreate a quilling design that you’ve made in the past. I have a process of sketching out my all ideas in one of my notebooks. Then, once I’m happy with the layout, I draw it on tracing paper and build off of that. I have a ton of these tracing paper sketches in a basket on my drafting table workspace, When I need to stock up my shop with my core products, my drawn templates are ready to go. When I want to freshen up a standard design, I have a starting place. I even have a bunch of sketches with the measurements of the quilling strips I know that I will need written right on the paper for speedy reference. When you’re not spending precious minutes reinventing the quilling wheel, so to speak, you’ll have more opportunity to learn new techniques and grow your crafting muscles. In our home, my work space is in one of the closets in our master bedroom. It is a pretty small space. Every few weeks, the drafting table that I work on becomes a huge mash-up of quilling paper strips, tools, and works-in-progress. I tend to get so excited about my ideas that I start new projects before I’ve cleaned up or even finished what I had been working on days before. Whenever I have too much going on or too much clutter, I simply do not create as well. I rush and make silly mistakes and I blame that all on the messy space that I’m working in. When I take the time to straighten up my quilling area, my vision is clearer. Then I can slow down enough to make the paper crafts that I see in my head. I’m sure that almost any aspect of quilling that you’re stuck on or have a question about has been answered and shared online. When you’re in a place where you’re having a bit of trouble, take a moment and do a little research. I’m sure you will find a post addressing the problem you’re having. Once you’ve gotten some advice, I’m sure you’ll be able to move right along and conquer something new! Not all quilling tools are created equally. There are needle tools and slotted tools. Plastic handles and wooden handles. Plenty of choices of glues, papers, tweezers, and work boards. There’s even battery-operated quilling tools that do the rolling for you. I, personally, have tried a few different tools before I found the needle tool that I prefer. I held off for a while before I understood the beauty of a quilling comb and needle-nosed tweezers. But that’s me. Other quillers will feel differently, and they will use the tools that make them the most comfortable. While most tools won’t really affect your final product too much, they will affect your enjoyment level while you’re creating your quilling paper masterpieces. And if you’re not enjoying yourself, what’s the point? I know there are quilling paper artists who don’t use pins to keep their work together as it dries. I am, for sure, not one of those people! Not only do I love my straight pins, I have a few different sizes that I rely on for different reasons. Some are taller and fit in tighter spaces. Some have brightly colored heads that I can plainly see in the midst of all my paper strips and curls. When I use straight pins in my quilling, I can place my coils and swirls closer together and get cleaner designs. Plus, pins keep my designs and papers in place, so my hands are free to keep rolling. Golfing great Sam Snead once said “Practice puts brains in your muscles”. What’s true for sports is also true for quilling. Practice might not make you perfect, but practice will make you better. Get comfortable with your tools and paper. 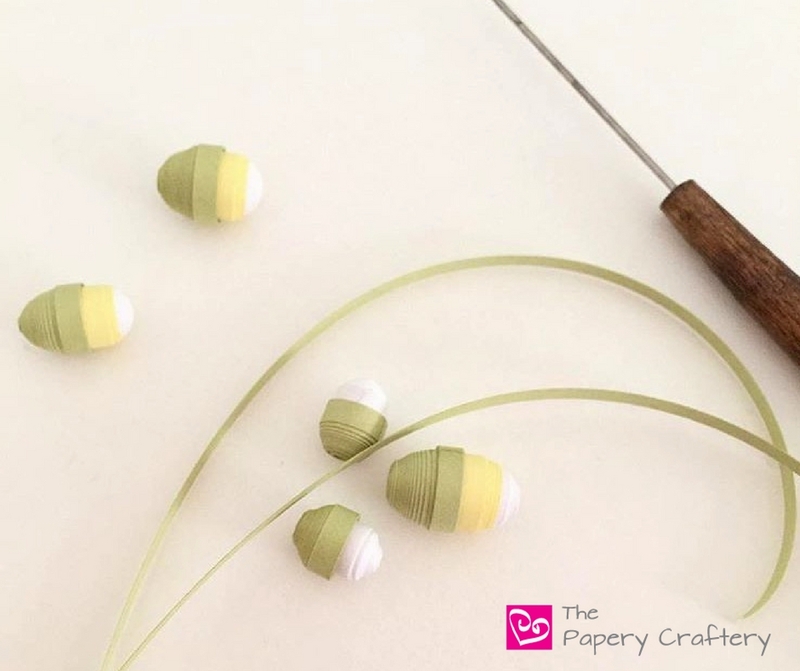 Not only will your muscles and your brain get used to the techniques of quilling paper, you’ll soon become more proficient at your craft, and more likely to experiment with your own style so your crafts will really stand out from the quilling pack. All that practice is going to bring one more thing: confidence. The more you see that you can, in fact, make these amazing quilling paper designs, the more you’ll want to keep creating. And then, there’s no stopping you! I know you can do this. I know you can become the quilling paper artist that you want to become, no matter what level that might mean. And, while you’re working on upping your game, I’ve made a little graphic list of these simple ideas to remind you of the completely actionable steps. Go ahead and Pin it. Print it. Share it. Whatever gets you motivated and excited to keep quilling! Wow. It’s a perfect activity for me and my girl. We’d enjoy our time together, creating something lovely. Thank you for the awesome tips!! Awesome! Quilling is really easy to pick up with a little practice and it’s a really inexpensive hobby, too! I honestly never heard of quilling before your article but it’s awesome! That’s great, Sarah Jean! I hope you’ll give it a try! I started quilling back in the mid 70s and quit in the early 2000s. My son showed me some new art designs at Christmas and I’m back at it! My only problems now are sore shoulders/neck, slightly shakey hands, and two cats who love getting into the storage basket drawer of paper! Think i might try the notebook method so I don’t find paper strips all over when I get up in the morning! I’m so glad you’ve decided to take up quilling again! I really think it’s going to be the next big craft. I can only imagine how much fun those two cats are having playing with your strips!